The teaching style and presentation has been strengthened throughout, and includes learning objectives and “recap” links at the beginning of each chapter that remind the reader of key findings and principles, while cross-referencing makes it easy to locate related information quickly and efficiently. There are also more case studies, with detailed answers applying theory to practice. Richard Holt is Professor in Diabetes and Endocrinology at the University of Southampton School of Medicine and Honorary Consultant in Endocrinology at Southampton University Hospitals NHS Trust. He is also a Fellow of the Higher Education Academy. Neil Hanley is Professor of Medicine and Wellcome Trust Senior Fellow in Clinical Science at the University of Manchester. He is Honorary Consultant in Endocrinology at the Central Manchester University Hospitals NHS Foundation Trust, and Director of the Academy for Training & Education at the Manchester Biomedical Research Centre. 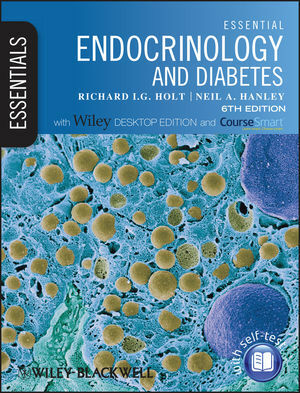 "Essential Endocrinology has been a brilliant book for my general medicine placement. It is concise and well-illustrated, and its handy size means it is not a hassle to carry it when away in regional hospitals. The case histories have been a particularly useful feature of the book to test my understanding of endocrinology in a clinically relevant manner. I feel the content of the book is pitched perfectly for medical students.